First, put the leek, the mushrooms and the cabbage in a food processor and blitz until finely chopped. Heat the peanut oil in a saucepan, and fry the veggies - add the grated carrot as well, until softened. Ideally try to drain out excess fluid at this part - we didn't and our filling was quite wet. Place the softened veggies in bowl, and add your aromatics - ginger, soy, sesame oil, sambal oelek (or finely chopped chili), and coriander. Add the corn starch as well, and season with a little salt and pepper. Place the flour in your food processor. Put the lid on and start the machine. Add the boiling water through the tube, with the machine running. Stop after a few seconds - the dough should look crumbly, and hold together if you pinch it. Knead the dough carefully - it's HOT! - on your kitchen counter for about 30 seconds, or until it looks supple and elastic. Place in a ziploc bag and seal it. Let the dough rest for at least 15 minutes, but no longer than two hours. -roll out the dough, using a pasta machine. Not too thin - they should be fairly thick. I went to 3 or 4 on my machine. -place a spoonful of filling in the middle of each round, fold, and start pinching the edges together. Repeat. And work fast - you don't want the dough to try out. (In fact, keep whatever dough you're not rolling in the sealed ziploc bag.) It helps to be at least two people, working together. Next, heat some oil (I like peanut) in a frying pan with a lid. Have a small glass of water nearby. When the oil is hot, add some dumplings - but don't overcrowd the pan. Fry until the bottom is golden. Then, add the water and quickly cover with the lid, and let the dumplings steam for 5-7 minutes (a few more minutes if cooking from frozen). Remove the lid, and re-crisp the dumplings. They look absolutely perfect! 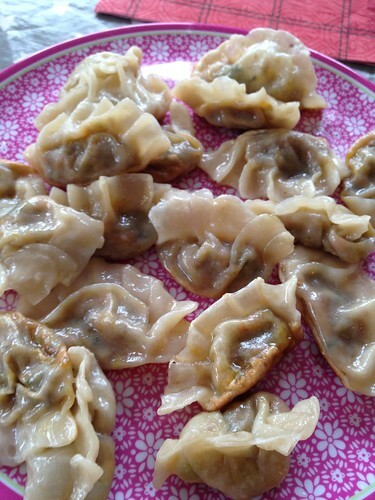 I've never tried making my own dumpling skins before, I am totally impressed. God, just made my day. Will need to make this with pork and cabbage... thinking Gyoza here. Looks very yummy, I prefer the vegetairan version than the meat version so this is awesome! I love the vegetarian version of potstickers, and you can vary so well! BTW, I just spent 2 weeks in China (some pictures are on my blog) and had some authentic ones there, some are also vegetarian. Spinach as a filling is good, too. And mushrooms.